Here is the Zvex Instant Lo-Fi Junky again, this time with a Fender Strat and a Fulltone OCD overdrive. Thanks to Josh Flynn for shooting the video. Here is the new GorillaBox 12U briefcase for musicians who plan to travel. This eurorack case is 104hp wide with 4 rows, yet is compact enough to be a carry on when flying commercial airlines! The music track is "Printed Heart" by John Tejada and Josh Humphrey, courtesy of Palette Recordings. 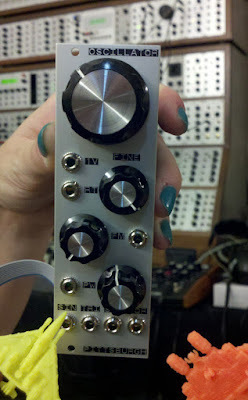 Here is the new Moog MF-108M Cluster Flux processing a loop from the Elektron MonoMachine. This new Moogerfooger is loads of fun! Pittsburgh Modular Oscillator modules are now in stock at Big City Music! Here is the Zvex Instant Lo-Fi Junky pedal on a guitar being played by our customer, Mark Tschanz. We wanted to show the striking visual beauty of the Eowave Ribbon in a darkened environment, which makes it a standout for live shows! In this video we are using the Eowave Ribbon to control a Dave Smith Instruments Evolver whose output is being processed by an Eventide Space. We wanted to show the Sound Of Shadow's insert in this video. You can patch the delay out to an external processor module and affect just the delayed signal. In this instance we're using the WMD Geiger Counter to add some bit crushing to our delays. This works great with all kinds of effects too. 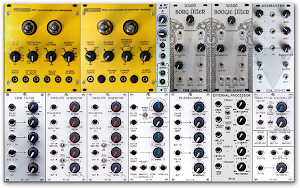 Try a ring modulator, a distortion, or even another delay for some great results.